Thanks to a grant from the Big Lottery Fund’s Heroes Return 2 programme, a war veteran from North Wales recently returned to her native Malta to recall the role she played in defending the strategically important Mediterranean island from falling into the clutches of Nazi Germany and Fascist Italy during the Second World War. Malta Story, a classic 1953 British war film depicts the love story between an RAF pilot, played by Alec Guinness, and a Maltese girl during the heroic air defence of Malta when the island was under siege. 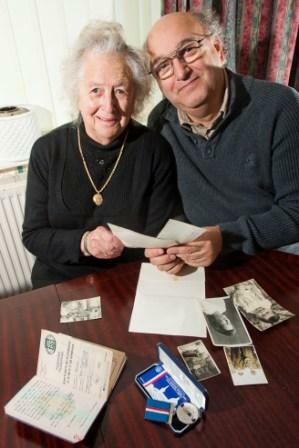 Josephine looks through some old photos and memorabilia from WWII with her son, Paul Roberts. This month, 85-year-old Josephine Barber from Rhyl returned to her native Malta with her son, Paul Roberts, to recall her very own ‘Malta Story’, which bears an uncanny resemblance to the love story depicted in the wartime classic. Josephine was a plotter in the Lascaris underground War Rooms during the conflict and had the important job of directing British Forces to engage enemy aircraft and monitor their activity. My mother Jane Ciaparra was a plotter in the Lascaris underground War Rooms any chance someone remembers her please?